Bathroom facilities in historic dormitory buildings are typically in need of renovation because of code violations and outdated fixtures. Harvard’s Old Quincy (pictured here) was recently renewed to match today’s standards and needs by the Philadelphia Architectural firm Kieran Timberlake. Renovating to preserve the historic character of a building while providing a higher performance design with more function and storage continues to be popular with Design Professionals on college campuses. With bathrooms, a moist environment is tricky for creating a functional design. Anything wood will swell and eventually deteriorate. Early dormitory buildings like Old Quincy historically utilized polished marble for bathroom areas which would easily stain and eventually crack and spall. Any type of storage in bathroom areas was also not a priority back in 1930 when Old Quincy was first built. A solution to this problem is not only utilizing solid surface for the vanity tops and shower areas but also for built-in storage as well. 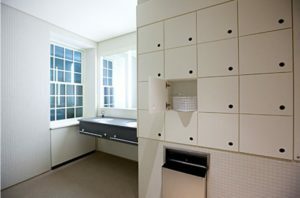 Kieran Timberlake designed the renovations to Quincy Hall and ASST was selected to fabricate the custom white solid surface storage bins in the bathrooms. Used for student toiletry items, holes drilled through the door faces are used as a finger pull. Students will likely find the new bathroom storage and overall improved “Old Quincy” a welcome place to call home on the Crimson campus. This entry was posted in Education Architecture & Fabrication and tagged bathroom, college, solid surface, university.